Ugh I’ve moved WAY more than I care to admit! I actually counted how many time I’ve moved (a few moves back) I was so frustrated with it. My total then was about 28 since I moved out of my parent’s house at 18. Now I’m closer to 30 times! WAY, WAY too many times too move, and I’m only 35! Pick up boxes, packing tape, and a sharpie for labeling as soon as you know you’ll be moving! I personally love buying totes but this can also be expensive, but they make it incredibly easy to get in and out of when you need to add things, or end up needing something from it! Plus if you get the clear ones, you can see what’s in them! Have lots of food in the freezer and pantry? Start eating it up now and resist the urge to shop for more! This means less to pack! Start shopping less all together until you’ve settled into the new place! Start packing as soon as you can! If you’ve got weeks before you will be moving, now is the time to start packing up those things you won’t need between now and the move (like those keepsakes, pictures, seasonal clothing, etc). Do a little each night, and this will really help cut down on time needed the day of the move! While you’re emptying out closets to pack things up, clean it! Keep your cleaners with you in the area you’re packing and get your cleaning done as you empty those shelves and cabinets! Be sure to clean from top to bottom! While you’re packing, start a donation pile as you go through all your stuff. Want to make a little extra money to help pay for your move? Host a garage/yard sale with your stuff you’d like to get rid of! Do this as quickly as possible to get the stuff out of the house and to keep it from accidentally getting packed! Start moving over utilities as soon as you can! Usually, you can set them up in advance to start billing for the day you move in. Don’t forget moving your cable, internet, and phone land line. At least a week before the move, change your address over with the post office. You can conveniently do this online with USPS.com. Start changing your address on your bank account, cell phone, credit cards, employer, insurance, etc over to your new address. Got a key to the new place? Assuming you live close enough to it, Start moving over boxes as soon as you can. If you get a key on Monday but aren’t moving in until Saturday, take over a car load each night after work. This will help cut down on all the moving you will be doing over the weekend. 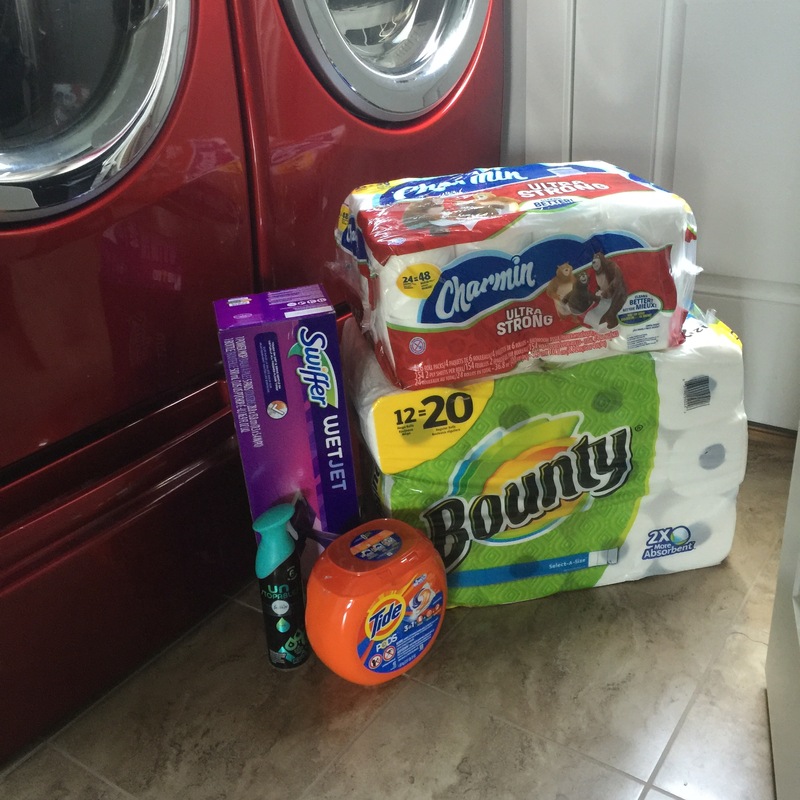 Once you have a key, now is a good time to make a quick trip to the store for the must-haves you will need as soon as you move in and will often times forget, at least I do! I love to go to Walmart and buy Charmin Toilet Paper, Bounty Paper Towels, and Fabreze Air Effects from the New Home Clean Collection. The toilet paper is a no brainer, but how many times have you moved and used the bathroom only to realize you don’t have any toilet paper!? This makes the move more efficient and comfortable, and if you’ve got some family and friends helping you with the move, they will to be able to use the bathroom in the new place without a second thought. The paper towels also come in handy for tons of things during a move, there’re tends to be tons of spills and messes made! (Hopefully not, but I always end up going through way more paper towels than I think I will!) The Fabreze also comes in handy when unpacking fun things like those old shoes you wish the hubby would’ve thrown out, the dog blanket you forgot to wash first before packing, or the fun box with the cat litter box in it! When you’re coming up on the day or two before the move, take down the curtains, drapes, bedding, and give them a good wash and then pack them. 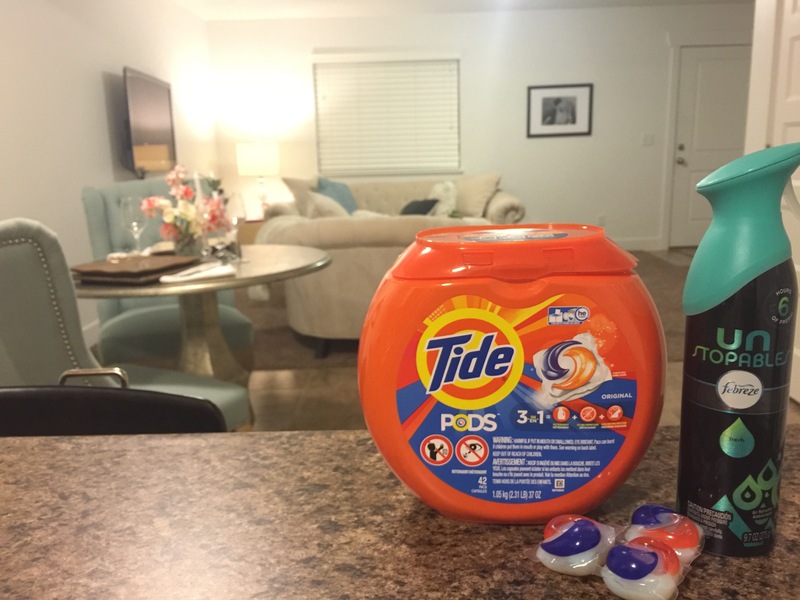 I like to toss my Tide Pods in the laundry machine with my linens for a nice sparkly clean. Especially because its been probably at last a year since I’ve washed the curtains and I only trust my Tide to give them the best possible clean when they need them the most! Moving Day! Be sure to eat breakfast, be grateful for the smooth move (even before you start moving) and smile! This will help you keep the right mindset for the stressful day ahead! Be thankful for your movers, friends and/or family or whoever came to help you, be sure to pick up some pizza for them for lunch to thank them for all their help! Got animals? Put the dog in the backyard if it’s gated, and lock the cats in a bedroom (either in the new place or old place) with the things they need; food, water, and potty Be sure to let your movers know to leave that room alone until very last, so that your pets don’t get out and make a run for the door! *Cats often become stressed from the move and try to find their way to the old house! This is often times when animals get lost/run away the most! Make sure they’re safe, and I’ve found that by keeping them in a room with the door shut while the whole moving is happening, also helps them feel less stressed. Once you get to the new place, place rugs at the entry way to help keep the tracking of dirt down in your new place down. Also, I find this technique works really well for unpacking: Have the men or tough lifters start bringing things in. The ladies or younger ones can start putting stuff away. This also keeps less traffic from going in and out of the house to the moving van, where you tend to end up standing around waiting to get in to the moving van. Once moved in, I break out my handy Swiffer Wet Jet and give the old place a quick cleaning . Since you’ve cleaned as you’ve gone along with the packing and moving boxes out, this should be the last thing to do in order to have the old place clean and ready to go! I also use it in the new house as I’ve found that all that in and out traffic moving in boxes, has left the floors very dirty! The Swiffer Wet Jet is a quick, easy, and efficient way to clean up after the move! Ready to get started with your move? 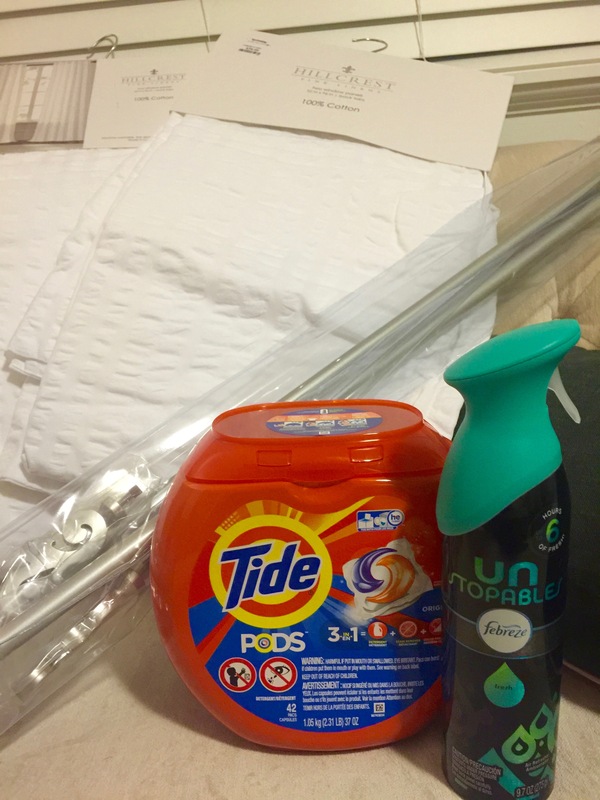 Be sure to head to Walmart for some of these Fantastic P&G Products to help make your move more successful and easier too!